Coffee House Press, 9781566892063, 98pp. 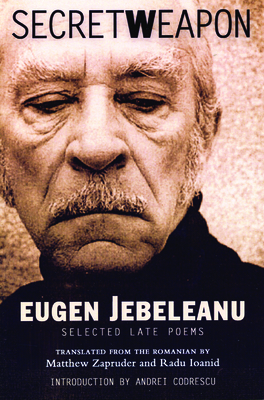 These spare and allegorical later poems of Romania's great poet, Eugen Jebeleanu (1911-1991), are deeply moving expressions of collective and personal guilt from an artist whose early participation in and later disillusionment with the regime lend his work a particular, searing authenticity. Appearing in English for the first time, these profoundly unsentimental poems are politically and artistically significant lyric testimonies. Born in 1911, Romanian poet Eugen Jebeleanu published twelve collections of poems, received numerous European literary awards, and was nominated by the Romanian Academy for the Nobel Prize. By the time of his death in 1991, Jebeleanu had transformed from a young, committed communist to a bitter and unsparing critic of the Ceausescu regime. Secret Weapon was his final collection. Poet Matthew Zapruder is an editor with Wave Books. He also teaches creative writing at the Juniper Summer Writing Institute at the University of Massachusetts in Amherst and at the New School in New York. Born in Bucharest, Romania, Radu Ioanid is the author of several books on Romanian history and the Holocaust. He works as Director of International Archival Programs Division at the U.S. Holocaust Memorial Museum in Washington, DC. Writer and NPR commentator Andrei Codrescu was working on a film exploring life along the Mississippi, when Katrina slammed into his hometown. After hosting scores of refugees in his Baton Rouge home, Codrescu released his essay collection New Orleans Mon Amour, becoming one of the many important voices celebrating New Orleans culture, recording its devastation, and awakening America's conscience.